I always wanted a car racing game a la Crossy Road. 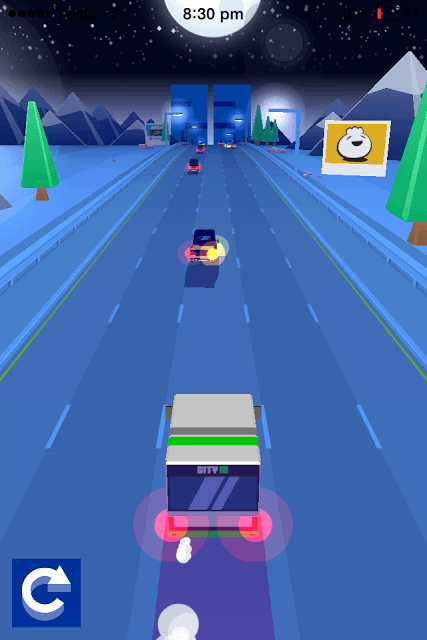 Seems Dumpling Design read my thoughts and created a fun game full of vehicles – four-wheelers, racing cars, trucks and a tank. Although technically it’s not a racing game, it has vehicles – lots of them – and an obstacle course that can be quite challenging if you don’t pay attention to the heavy traffic on road. Dashy Crashy is an “endless runner” on petrol, where you keep driving, switching lanes and avoiding traffic until you crash. You can start again to beat your previous score and unlock some cool vehicles. The highway is yours if you know how to dodge traffic and these tips, hints and tricks show you how to race past your friend’s and AI vehicles, score more points and unlock stunning vehicles. When the game says “catch that car”, it suggests that going past the car will unlock a new vehicle. Usually most “rival cars” have a gift icon blinking on top of them. When driving, pay more attention to what the lady says and you will probably be safe most of the time. Lorries and trucks are more durable and won’t be destroyed when they bump into another car for the first time. The Garbage Truck and Lorry can take 5 hits. The Delivery Truck can take one hit and gets destroyed if it hits a vehicle again. Ru can take one-two hits and if it takes a third hit, it’s, yes you guessed it right – Game Over. The Lorry Cab can take three hits. The bus can take maximum of 3-4 hits and usually crashes if it hits a vehicle the fifth time. Most trucks can take more than one hits and can be extremely helpful for longer drives. You will get more points and unlock more vehicles if you start using these trucks. The trucks mentioned above can be unlocked pretty early. Once you have unlocked the Ru, Lorry Cab, Lorry and the Garbage truck, use only them to get more points and beat tougher lanes. To avoid the crash, keep looking for the crash site. The game will warn you of an incoming crash site, so keep looking for damaged cars. You will be able to spot smoke or a bunch of cars stacked up from a distance. Once you see one, quickly move to a different route. You will have to be pretty quick in swiping right or left, because the crash site may cover more than one lane. There will more than one crash site, so keep looking for damaged cars and switch to safer route. Keep an eye on every vehicle’s rear lights. A vehicle’s rear light blinking indicates that it is about to change lanes. If a vehicle’s right light blinks, it indicates that the vehicle will move right. If a vehicle’s left light blinks, then it will move left. Plan your lane-switching based on a vehicle’s tail lights. Use the brakes when you see too many cars ahead of you. There will be several obstacles once you get past rank D. The highway will be crammed with vehicles. This is when you have to hit the brakes more often and swipe left or right to avoid heavy traffic. Swipe down to slow down your vehicle. When the coast is clear, swipe up to drive faster and rake in more points. Hit the brakes when you notice that you car is moving too fast and this usually happens when you move past rival card ranked C or B. You can also use them when you super fast cars approaching from behind. This is when the lane turns into a different color. Keep playing to unlock new vehicles. At the start of play, you will unlock some new vehicles every time you move past a Rank D vehicle. Moving past rank C vehicles will give you better cars. If you drive for a longer period of time, you will rank higher. The higher your rank and the longer time to drive, the better vehicles you will unlock. However, that does not mean you will receive a stronger vehicle. Many higher-ranked cars can be easily destroyed if they hit a vehicle once.